From August on wards lots of birds migrate here to escape the harsh northern winters. These winter birds will stay until the spring before heading back up to breed so in the meantime we get to enjoy them. Look out for the winter birds . On the pools will be the winter waders and ducks which are visiting us from the cold north. In the hedgerows you may see the winter thrushes, feeding on the berries. 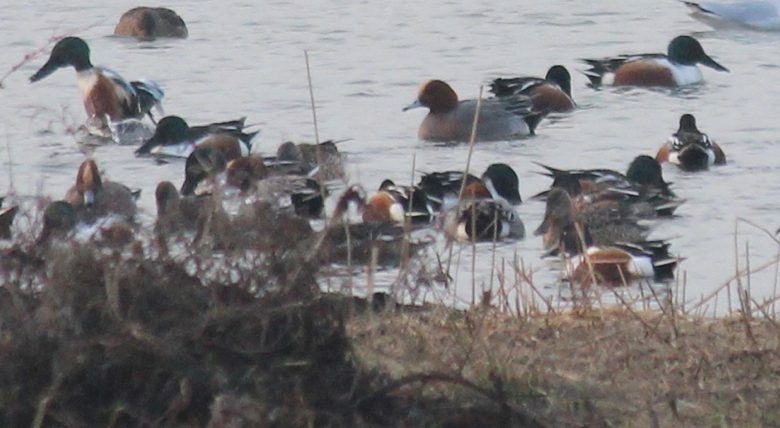 The winter ducks including the wigeon , teal and shovelers and even the occasional pochard . You can see these on the ponds and the shoreline. Shovelers with dark heads, wedged beaks, white/russet bodies and wigeon. The wigeon are the ones that whistle. The winter wading birds such as the dunlin , lapwings and curlews . You might also see the winter thrushes on the hedgerows. The fieldfares and redwings will stay until all of the berries are eaten and then move on. Amphibians – Over the next month you will see frogs, toads and newts migrating to the ponds, particularly Frog Pond. They do this every year in winter to mate and lay their spawn here. If you want to help them migrate safely get in touch with the Portishead Toad Patrol. |Click here to see where the Frog Pond is.